Sometimes, you taste food overseas whose memory stays with you, and that you're desperate to have again at home, but are never really quite the same when not enjoyed in their native environment. To name but a few of my favourites: ah pong pancakes from Pulau Tikus in Penang, Malaysian roti canai, Mogador macarons from Pierre Hermé in Paris. 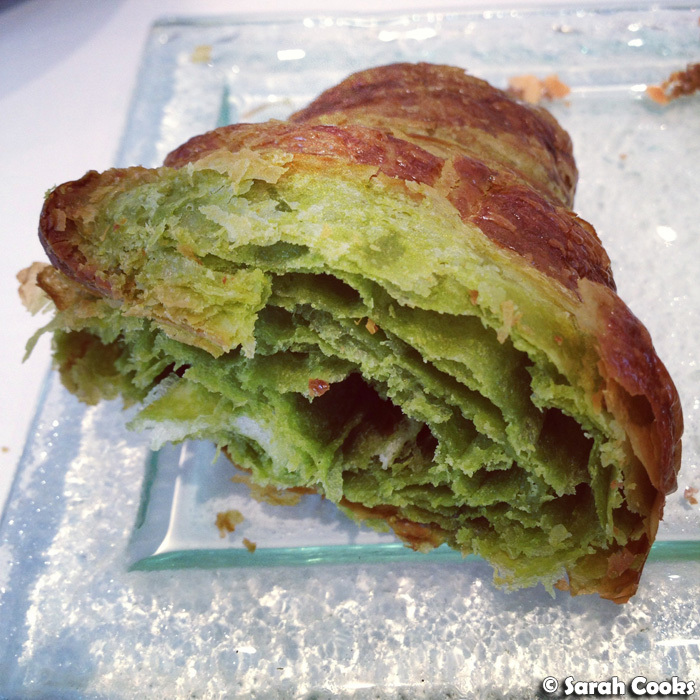 Perhaps my favourite "taste of overseas", however, is Sadaharu Aoki's matcha croissant, which I first enjoyed on my trip to Paris in 2011, and again last year. 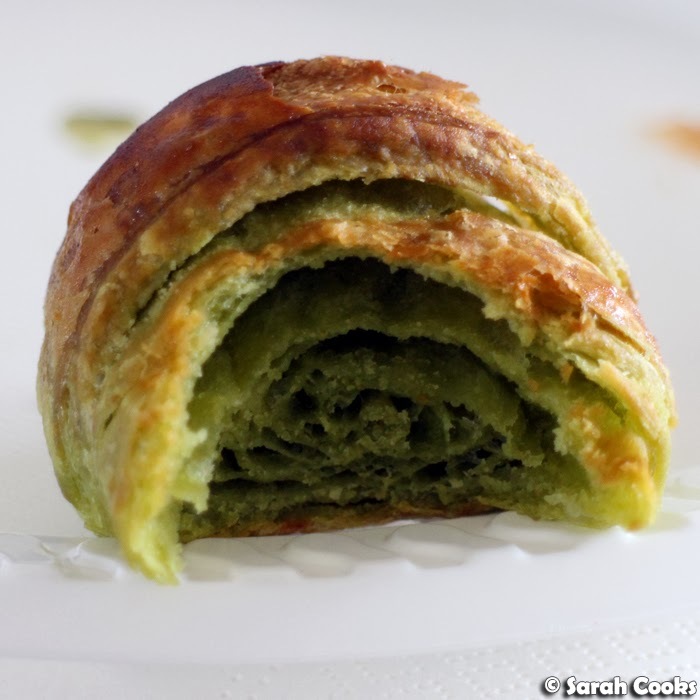 Look at the picture below - it's so flaky and perfect, with just the right amount of matcha flavour. So fabulous - no jam or other accompaniments required! Just apply to face. 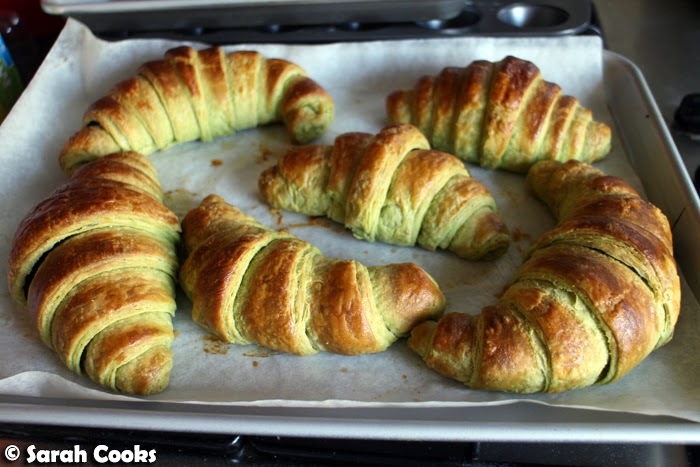 Ever since I came home I'd been thinking about these croissants and - you saw the first picture in this post, you know where I'm going with this - inspired by Sadaharu's deeply fabulous matcha croissants, I baked a batch of my own at home. Of course, mine weren't nearly as perfect, flaky and gorgeous as the Sadaharu Aoki ones, but they were delicious all the same. And besides, most imperfections pale in comparison to the deliciousness of a treat that comes fresh out of the oven. I made these for a tea party we hosted toward in December last year for some food blogger buddies - I was sure they'd appreciate them, and the recipe makes about sixteen croissants. I did not think it was sensible for me to be left alone with them! I used Nigella's recipe for processor Danish pastry, adding a tablespoon of matcha powder to the dough. Remember - Danish pastry dough and croissant dough is the same thing: a yeasted laminated dough. I have made croissants the long way before, but I don't think too much is lost from using the "quick" method. Quick is also a relative term - it still takes quite a lot of time! You use a processor to distribute pieces of cold butter throughout the dry ingredients (flour, yeast, salt, sugar and matcha). And then you stir through the wet ingredients (water, milk, egg) and let it prove in the fridge overnight. 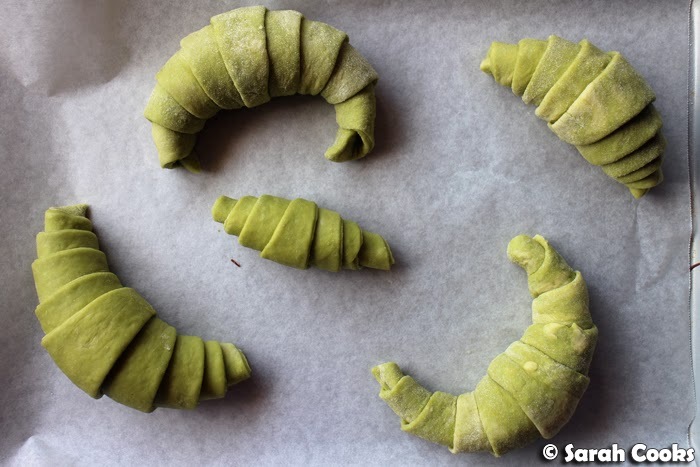 And now we have the "turns": rolling out, folding and turning the dough, which you have to do three times. If you were following the classic recipe, you would make the yeasted dough without any pieces of butter, then wrap the dough around a big flat block of butter before starting the rolling out process. (See my first croissant post for pictures). Furthermore, for the quick version, the turns are completed all at once, whereas the classic recipe instructs you to refrigerate the dough for thirty minutes in between each turn. As you can see, as the dough is repeatedly rolled out it gets smoother and neater, and the pieces of butter get distributed throughout the layers of dough. (This is what creates the puffy texture - as they bake, the water in the butter turns into steam, forcing the dough to expand and creating air pockets). I must admit, when I saw the dough, I did not think it would get to be so smooth and pretty! But it did. Phew! I'm not the best at cutting even shapes, so mine were quite uneven - perhaps next time I'll make an isosceles triangle-shaped stencil. Or not! Hehe. I don't mind different sized croissants. Matcha and white chocolate are a match made in heaven, so I added white chocolate chips to the scraps of dough and made little pains au chocolat. 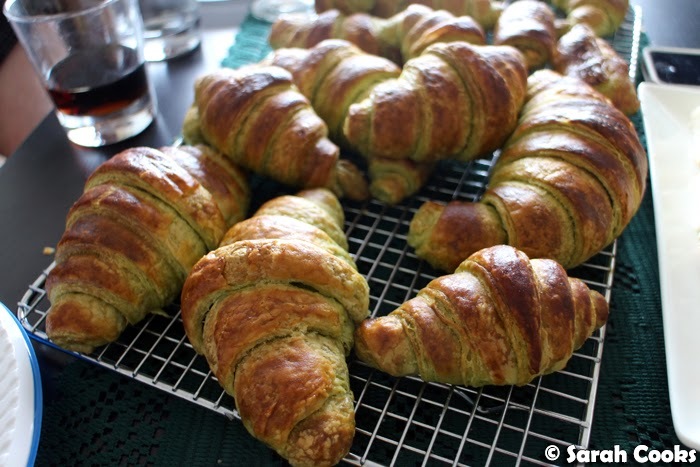 And finally, a big batch of buttery matcha croissants was our reward. I was so relieved that they worked out and looked like croissants! The matcha flavour was quite mild, so next time I'd use two tablespoons of matcha powder. (In the recipe below I've specified 1-2 tablespoons, depending on your taste). Yum town. Now I just need another excuse to bake more! Place the water, milk and 1 egg in a small bowl and whisk with a fork to combine. Set aside. 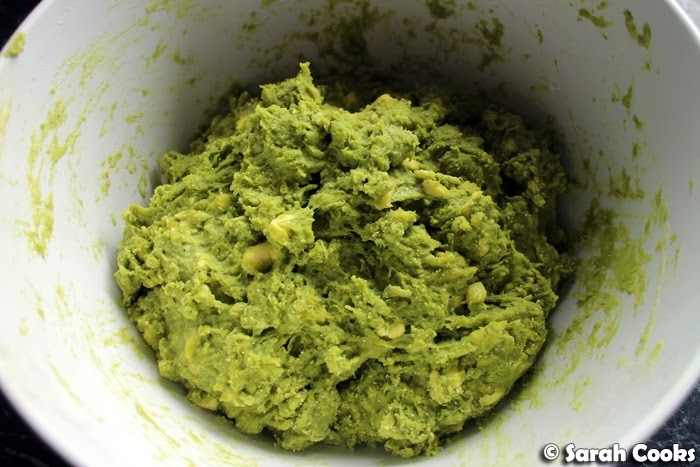 Place the flour, yeast, salt, sugar and matcha powder in the bowl of a food processor fitted with the double blade, and pulse briefly to mix. 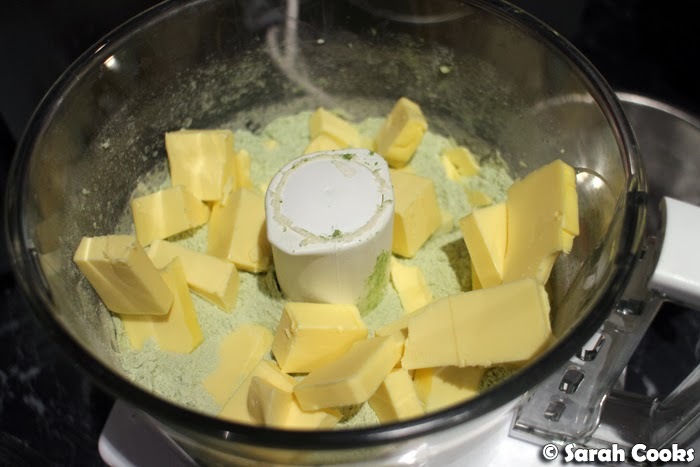 Add the cold butter slices and process briefly so the butter is cut up a little and distributed through the dry ingredients - you still want visible pieces of butter in there. 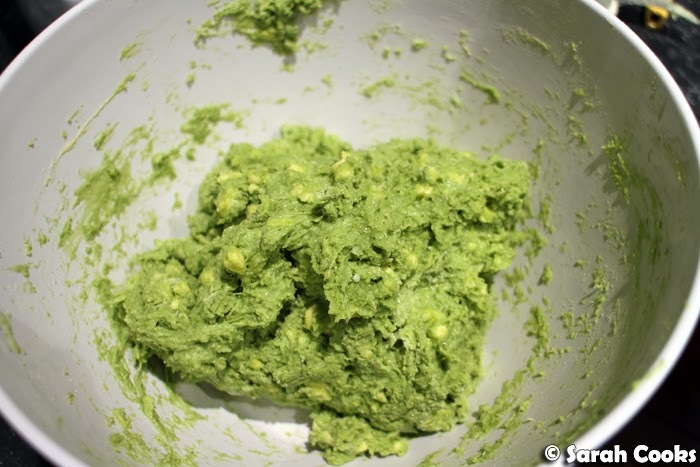 Tip the contents of the food processor into a large mixing bowl, and pour in the water/milk/egg mixture. Stir to mix. Cover the bowl with plastic wrap and refrigerate overnight. 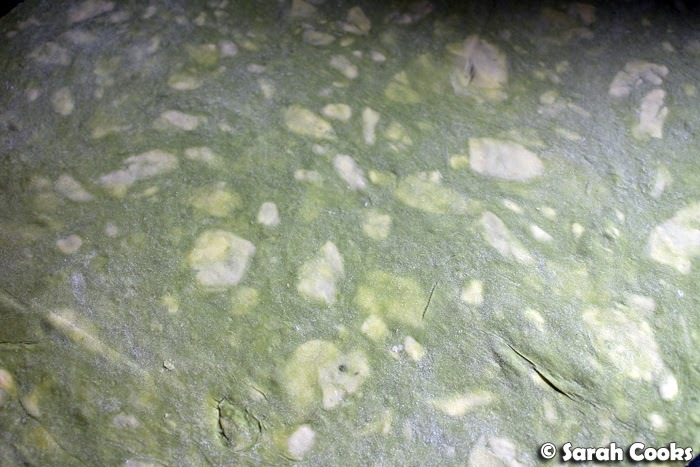 Take the dough out of the fridge and tip onto a floured surface. Roll it out to a square of approximately 50 x 50 cm. Fold into thirds, like a business letter. 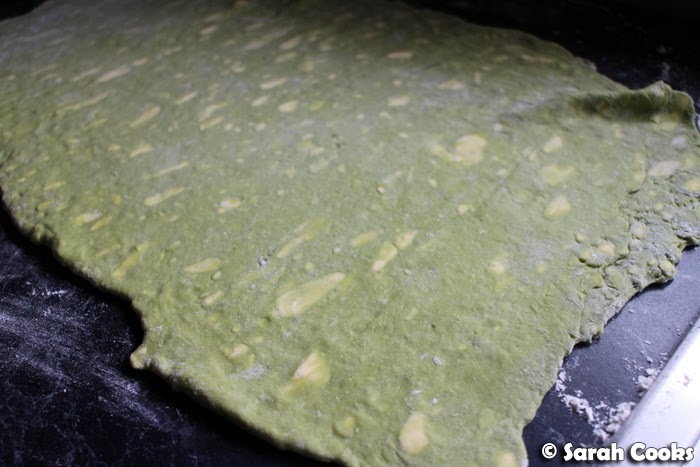 Rotate the dough so the closed fold is on the left hand side. This is the first turn. Repeat the rolling and folding process until you have complete three turns in total. 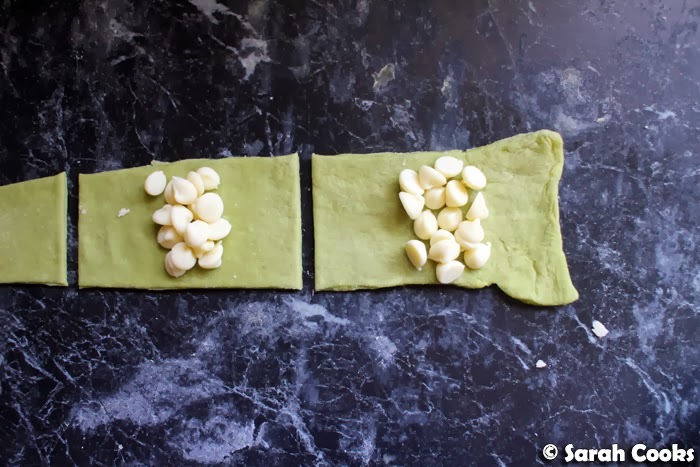 Wrap the dough in plastic wrap and refrigerate for at least 30 minutes. 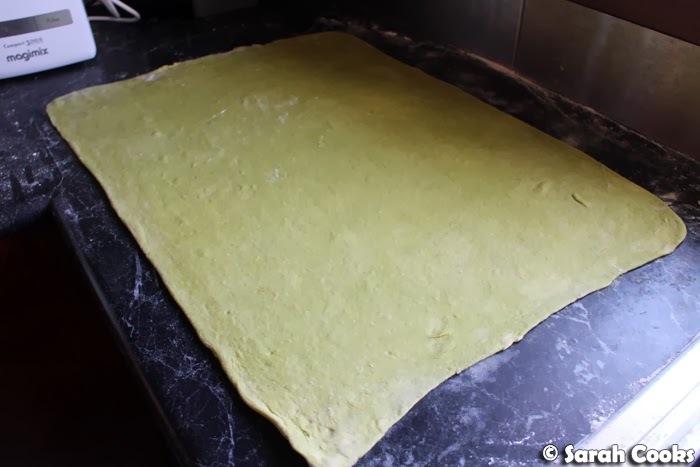 Roll the dough out into a large 50 cm square. 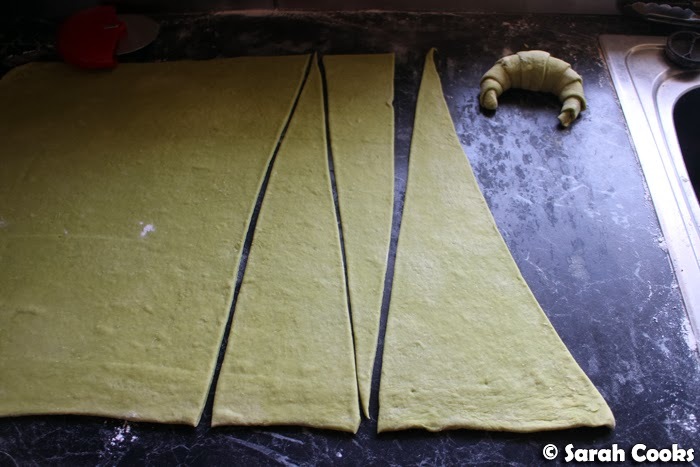 Cut the dough into long triangles and roll up from the wide end to the tip. Make sure the tip is placed at the bottom of the croissant so it doesn't curl up and burn when baked. Curve the ends in to form a crescent shape. Arrange the croissants on a lined baking sheet. Brush with beaten egg. Leave them to rise for 1 - 1.5 hours or until doubled in size and soft and puffy. Preheat the oven to 180C. 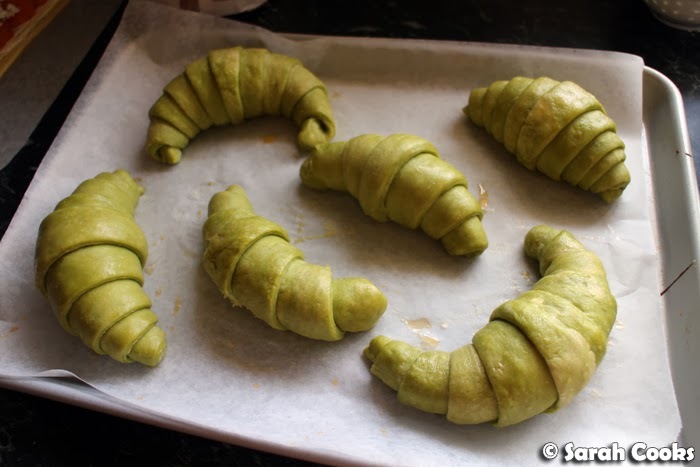 Bake the croissants for 15-20 minutes, or until golden brown and cooked through. Leave to cool slightly on a wire rack before digging in. While we're here, I thought I'd show you what else we ate at the tea party! 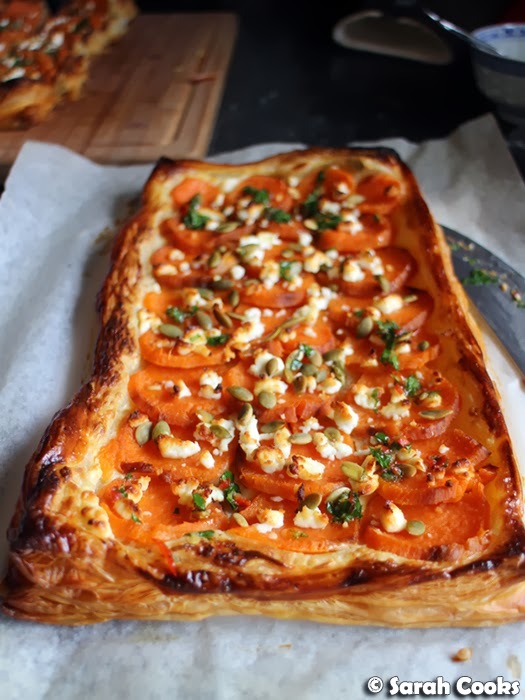 We did two savouries: Ottolenghi's sweet potato galette, which consists of puff pastry, sour cream, roast sweet potato, goats cheese and pepitas, topped with a mixture of garlic, parsley, chillies and olive oil. It's a favourite of mine, and I think it was the most popular item at the party. I also made some little crab and avocado sandwiches. The crab filling was a mixture of crab meat and Cayenne pepper, with some chopped chives, lemon zest and cayenne pepper. 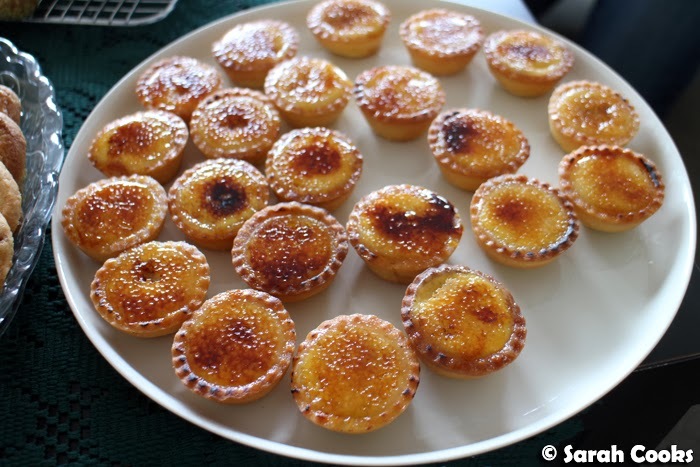 Sandra made these fab little crème brûlée tartlets - we used Carême vanilla bean sweet shortcrust pastry, which we blind-baked in mini muffin tins. They were filled with home made vanilla custard, topped with sugar and blowtorched until crisp and caramelised. They were super fiddly to make, but so worth it! 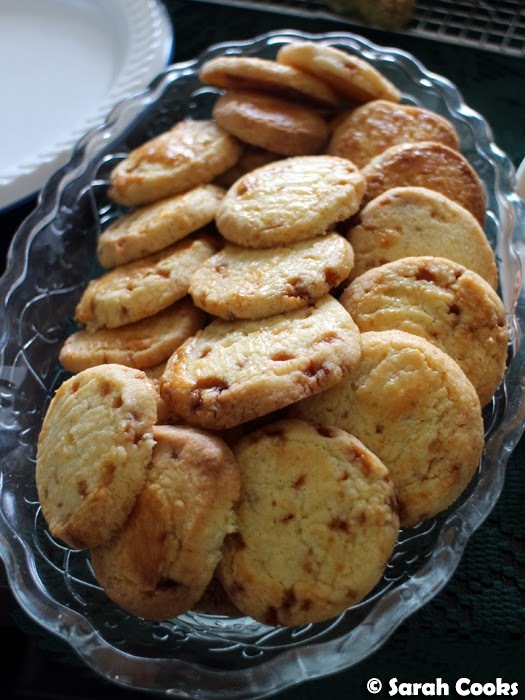 And finally, I made some French shortbreads with those salted caramel chips I brought back from Paris - petits sablés aux éclats de caramel au beurre salé. It was this recipe, to which I added 2 tablespoons of caramel chips. 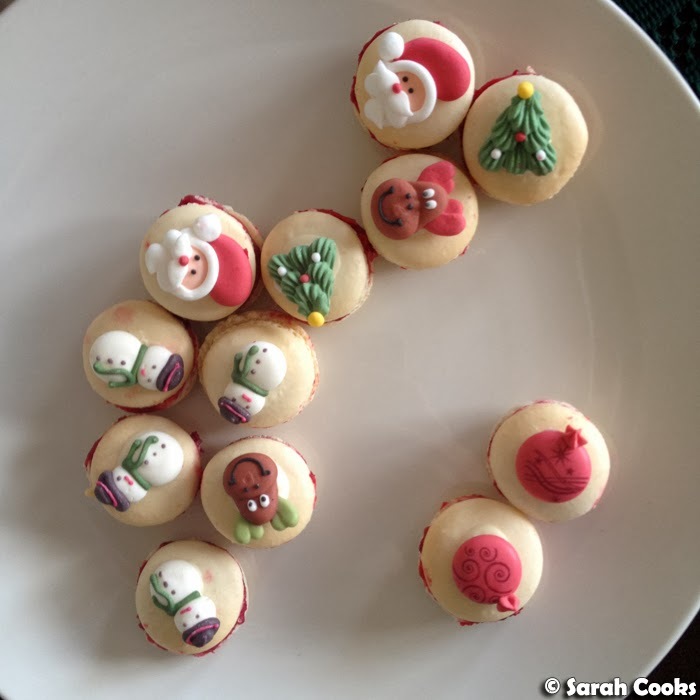 Daisy and Ricky made and brought these super cute little macarons, filled with fresh raspberry ganache. Those croissants look epically good (is that even a word?). When it cools down I really want to give them a go. 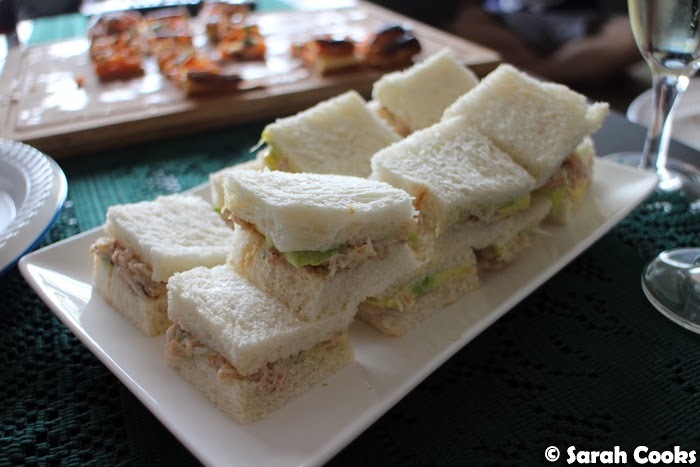 And those delicate crab sandwiches look so delicious! From the moment I saw the title of this post, I was thinking "WHITE CHOCOLATE". Apparently we are twinsies in more than just peanut butter. Sarah, that was one of the most memorable meals/afternoons I had last year, I'm not kidding. Can't thank you enough for being such a selfless host and sharing all of those treats with us. I can taste all of those foods in my mouth just from thinking about it. We have to do something again! WOO HOO!!! The recipe is finally up! Super excited to try but haven't had the time so sad :( But i'm so glad you've put the step by step photos up as well because then I can follow you exactly and hopefully it'll turn out as pretty as yours! Mmmm, it looks delicious! I love the green colour of matcha.